The Dems show a slight advantage (in the Senate and overall), but not much beyond the margins of estimation. Given the difficulties of estimation, the two parties spent about the same amounts this cycle on national elections. 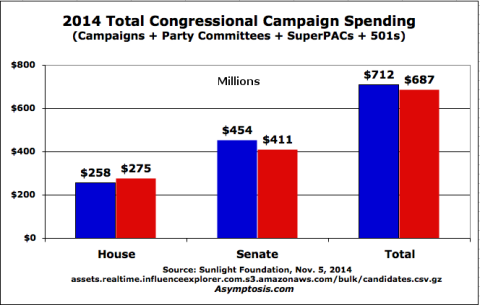 Spending was roughly equal, probably a slight advantage for Dems. The trickiest part of this estimate, based on Sunlight’s candidate spreadsheet, was allocating attack-ad spending by independent groups. If outside groups opposing Cory Gardner spent $30 million in Colorado (tallied in the spreadsheet on Gardner’s line), I posted that as $30 million “spent” by/for his opponent, Mark Udall. And vice versa. My spreadsheet’s here. Following are the Senate race-by-race spending totals. You may spot what look like anomalies, and you may be right. I obviously haven’t vetted Sunlight’s data. But if these numbers are close to correct, Democrats can’t claim a money avalanche by Republicans as a reason for the 2014 election results. None of this even glances, of course, at spending on state-level races. Given the condition of our campaign/electoral system and the amount of work it took to assemble these simple numbers, I tend to wonder whether that information will ever be known. Work hard. Save your money. Spend less than you earn. That’s how you become wealthy, right? Household “saving” — households spending less than they “earn” — contributes a remarkably small amount to increasing household net worth. And that contribution has shrunk a lot since the 90s. The capital gains mechanism appears to dominate the ultimate, net delivery of rewards to household economic actors. Earning more and spending less is weak beer by comparison. What does this say about our understandings of how the economy works? Does economists’ fixation with “saving” provide a useful picture of macro flows in the economy? Since asset ownership is hugely concentrated among the wealthy (even real estate), can we think about the economy’s workings at all without looking at distribution? Does this dominant mechanism allocate resources “efficiently,” or deliver the kind of incentives that make us all better off? And etc. There’s much more I’d like to say about this reality, but I’ll just provide one more graph for the time being and let my gentle readers ponder the bare facts. The spreadsheet’s here. Have your way with it. (It’s kind of messy; drop a line with questions). Imagine three types of wealthy people. One guy is putting his capital into building his business. Then there’s a woman who’s giving most of her wealth to charity. A third person is mostly consuming, spending a lot of money on things like a yacht and plane. While it’s true that the wealth of all three people is contributing to inequality, I would argue that the first two are delivering more value to society than the third. I wish Piketty had made this distinction. Piketty defines capital as synonymous with wealth. Wealth consists of all the tradable claims on real capital (specific ownership claims, generalized claims like dollar bills, and everything in between). 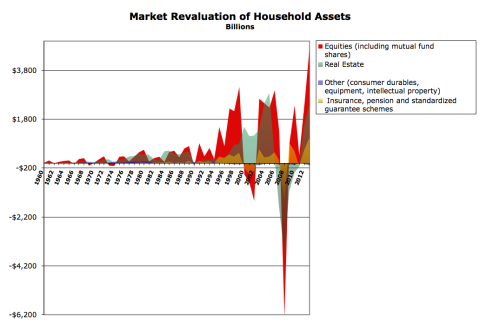 The market constantly reprices those claims, resulting in a constantly-adjusted best-guess market estimate of what the underlying assets are worth — ultimately expressed as household net worth (with all firm net worth imputed to household shareholders). 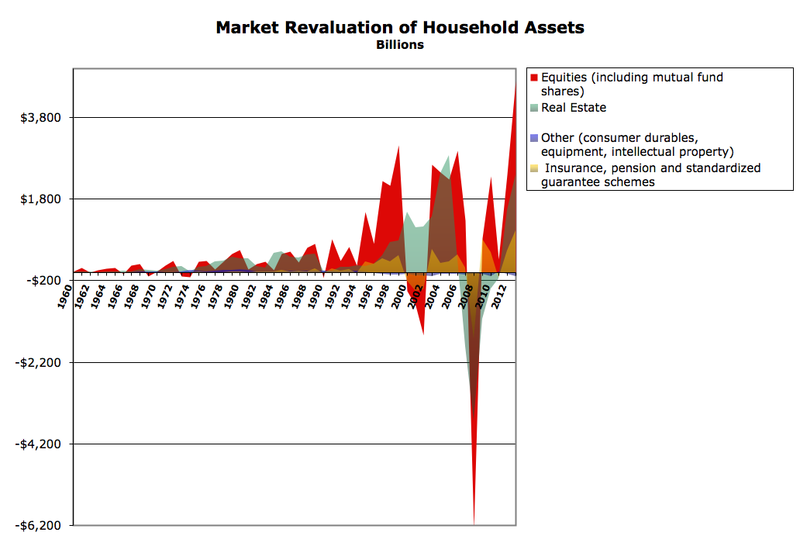 The market reprices the claims, based on its revaluation of what the underlying assets are worth. If it thinks the assets are worth more (will produce more in the future), it bids up the prices on the claims. Important: that stock of real assets is not just the “fixed capital” tallied (because it can be measured) in the national accounts; that’s actually a small part. Knowledge, skills, and abilities (think: education, training, health), business/organizational systems (this is huge), and similar unmeasurables constitute the bulk of real capital — the stuff that allows us to produce in the future. Most of that stock is not specifically claimed, but it is that whole body of real capital that the market it trying to value properly via pricing of claims — basically, holding up its collective thumb and squinting. Piketty should have called it Wealth in the 21st Century. That’s what he’s really talking about, because we really have no idea (beyond the market’s best guess expressed in household net worth) what our real capital is worth. “Financial capital” is an oxymoron. The basic point is very true. If poor people today have more and better stuff, can buy more and better stuff each year, maybe we should stop worrying about all those other measures that show stagnation or decline. Does this measure tell a different story? Curious cat that I am, I decided to go see. I had no idea what I’d find. The first thing I found: this simple data series isn’t available out there, at least where I could find it. Notably, the people who claim it’s so revealing don’t seem to have assembled it. The household spending measure is in nominal dollars. I converted the values to 2013 “real” dollars using the BEA’s deflator for Personal Consumption Expenditures. Here are the results (mean values; medians would be somewhat lower). 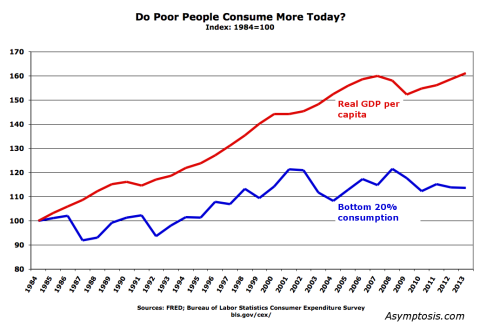 By this measure poor people’s consumption is up 5% since 1984 — not exactly the rocket-ship prosperity growth for the poor that consumptionistas proclaim. 1. 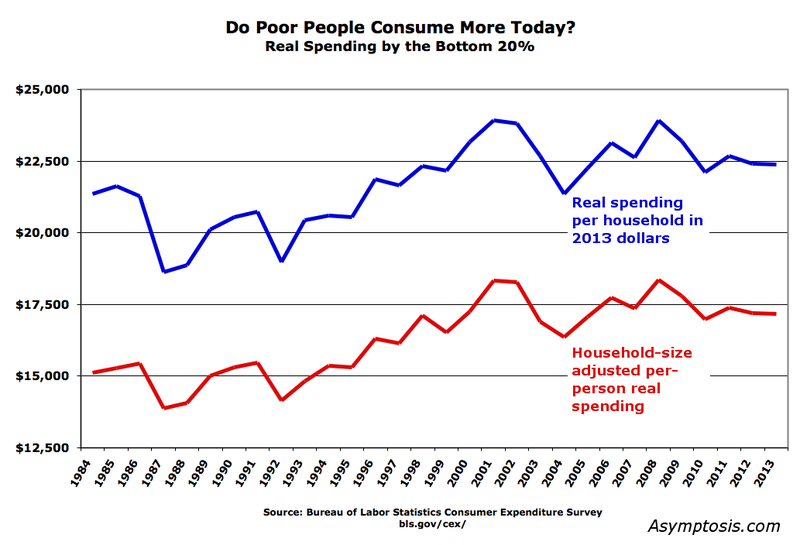 Per-person spending would trend up (if income per household is the same, with less people per household). 2. But: you have to adjust because living with more people is cheaper per person because of shared rent, utilities, etc. If you don’t, it looks like the average person in a four-person household consumes vastly less than a person in a one- or two-person household — which clearly isn’t correct. 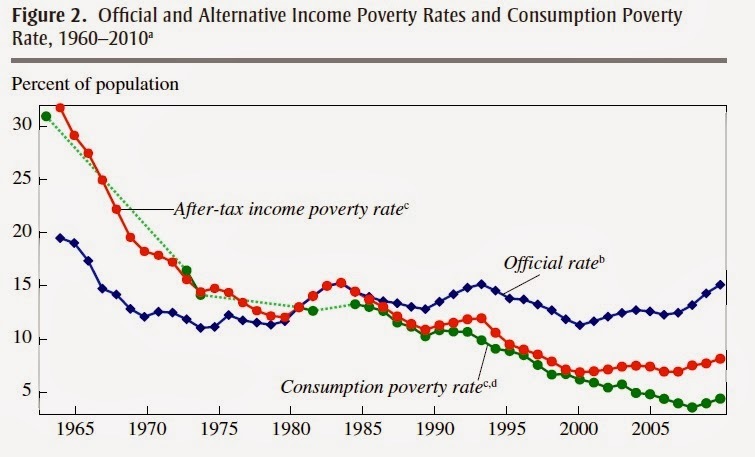 By this measure, things have gotten more better: poor people’s consumption is up 14% since 1984, compared to 5% using the other measure. But really, that’s still nothing to crow about; real GDP per capita grew 63% in that period — four times as fast. More comparison: the real price of a share in the S&P 500 has increased 370% over that period. That’s not counting dividends. 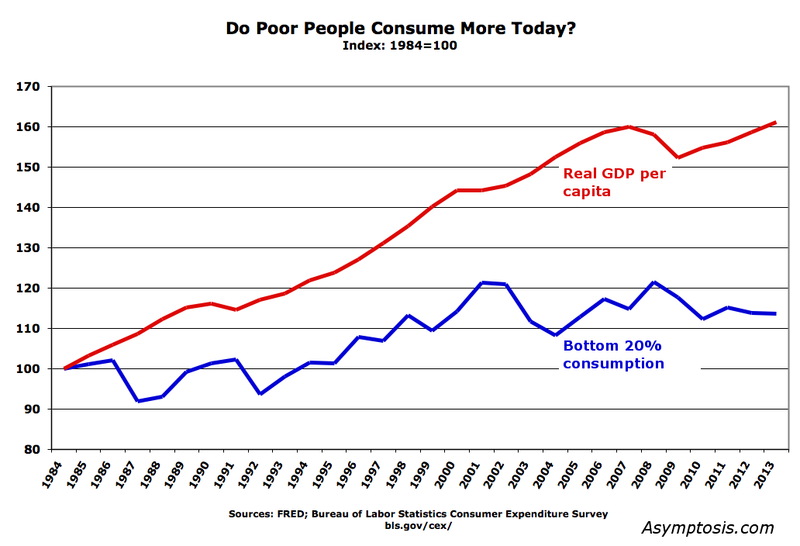 The consumptionistas are absolutely right: this is a really good measure. And it tells exactly the same story as the other measures. Here’s the thing: this study uses the same data set you saw above. But you’re looking at it through a very synthetic lens: a somewhat-arbitrary “poverty threshold.” What percent of people are below that threshold? Which means you gotta ask: Is that a relative or absolute poverty threshold? How does it change year to year? How’s it calculated? Etc. To say it another way: This measure is some calculation steps removed from — it’s a second or third or fourth derivative of — the data as measured by the BLS. I’m not saying it’s a bad or un-useful measure. I haven’t gone into the weeds with it. And Brookings tells you exactly how the threshold is calculated. But you have to understand the lens’s multiple assumptions and hold them in your head while you’re peering through the lens. The graphs above, by contrast, are much closer to “the facts on the ground.” Assuming you’re interested in those. Worth noting: the people who might prefer the story told by the Brookings poverty-threshold measure are the very same people who are forever complaining about measures that use arbitrary (and relative) poverty thresholds. Just saying. 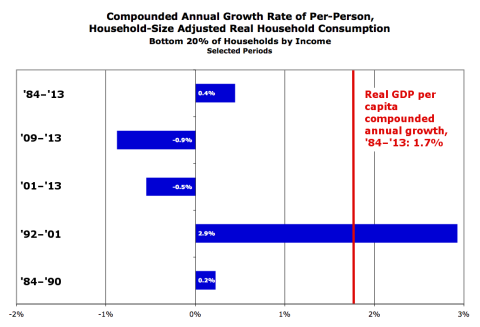 The inflation adjustment misrepresents poor people’s reality. The “real” consumption spending in the graphs is also filtered through a lens: the BEA’s price index for personal consumption expenditures. What if that index is wrong? It is based on “hedonic” estimates, after all: what’s the value (as opposed to price) of today’s laptop compared to 1990’s? Cars are far more reliable than they used to be; knowing that your car will start every time you turn the key has real value. Air conditioning is more valuable than box fans. And think of all the free digital goods that poor people have access to now — from Google to online banking to… Those have no “pricing,” so they’re undercounted or uncounted in this measure. This is basically saying, “you should create your own, different Consumer Price Index.” It’s exactly the same argument as the ShadowStats craziness, but in reverse: there’s not more inflation than is shown in the CPI, there’s less — more deflation. There’s a “true” index that’s misrepresented by the rather remarkable and diligent efforts of BEA statisticians. we should ignore all the official data, and use our eyes. Travel around the country. Go into poor people’s houses. … I think I do have a rough sense of the different sorts of consumption bundles purchased by different classes of people. You should construct your own CPI index by holding up your thumb and squinting, eyeballing poor people’s consumption bundles. Because…the official CPI is not saying what Scott Sumner would like it to say. The thing is, Sumner doesn’t even use a spreadsheet. He does it in his head. (Now that’s brilliant.) We should clearly do likewise, or just adopt his index — if we knew what it was. Finally, note: the comparisons above — to real GDP and S&P growth — use the BEA’s GDP-deflator and CPI indexes, which are only slightly different from the PCE index used here for consumption. Almost-identical apples to almost-identical apples. Feel free to mess with that in the spreadsheet if you’re so inclined. It won’t get you much of anywhere. The household-size adjustment is invalid. This is another lens interceding between you and the measured data, on top of the inflation adjustment. No doubt about it. But as with inflation adjustment, you can’t get around it. You can’t ignore shrinking household size any more than you can ignore today’s less-valuable dollars. And you can’t just divide household income by people per household, or people in four-person households look like they have vastly lower consumption than people in one-person households. That just isn’t reality. One part you might reasonably question: The Pew size-adjustment methodology uses a chosen variable that can be from 0 to 1; they choose 0.5 based on some decent research over the years. I tried values between 0.1 and 0.9. Lower numbers lower and flatten the red line, and show a consistent upward trend from ’84 to ’01 (flat thereafter). But the basic story is unchanged. Look: no method is going to give you the perfect gauge of human well-being — the”obvious,” magic-bullet measure that conservatives seem to forever be after in their eternal Search For The Simple. This consumption measure is no exception. But advocates of this measurement approach are absolutely right: it’s much simpler and easier to measure than most other measures, and it’s a very good measure of how poor people are doing. 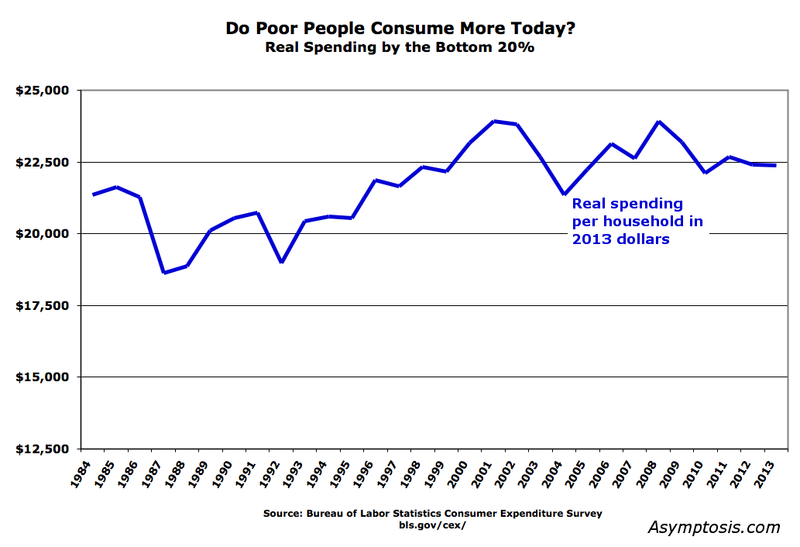 Bottom line: Poor Americans’ consumption grew, very slowly, over the past three decades. Meanwhile the rest of the country grew four times faster, and a typical stock-market investment grew at least 27 times faster. Do with that what you will. Adjust your priors as appropriate, if that’s something you do. How much of this picture is about young versus old? The population is aging; do we need to change the story this measure tells based on changing demographics? 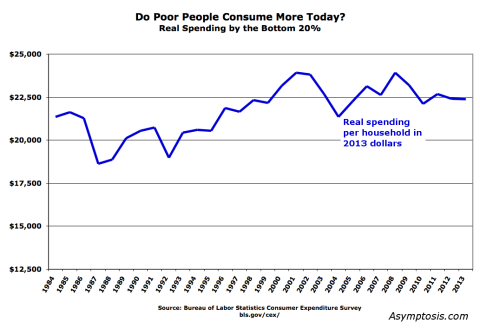 Did poor people take on more debt to achieve that higher consumption? How has that affected their lifetime well-being? Are poor people working more hours to get that consumption increase? Do they have more or less leisure and family time? How economically secure are people? What is the typical person’s chance of falling into this bottom-20% consumption group? How has that changed? I’ll try to address some of those questions in future posts. Amazon and Hachette: What’s Really at Issue? What is the precise dispute between Amazon and Hachette? “Control over pricing” is vague, doesn’t answer that. Prima facie, it seems that Hachette could charge whatever wholesale price it wants for books, and Amazon could charge whatever retail price it wants. But that’s apparently not the case? Absent a fundamental understanding of the specific matters at issue, I find it very hard to think coherently about the subject or draw any conclusions. I have a long and diverse history in book publishing, by the way, from publisher to editor to author, and everything in between. I’d really like to figure out what I think about this. Yglesias responded, and Winship responded to him. The basic contention at this point: who is actually “explaining” the situation? Do Scott’s corrections explain the situation better? Do they paint a 1. more accurate, and/or 2. more complete picture? By those two standards, is he more honestly and fully informative? Let’s run through his changes. 1. The household method as opposed to tax-unit method is at least a useful additional measure, and is arguably more accurate and explanatory. It’s also less complete because the data only goes back to ’79. But he completes it with Tcherneva’s (by this standard less-accurate) earlier data. It’s a useful addition to understanding, but with little change in the story it tells. 2. The full-business-cycle approach (as opposed to just showing expansions) is also arguably more accurate hence informative. But it (necessarily?) ignores the post-2007 period because the current business cycle isn’t over yet. 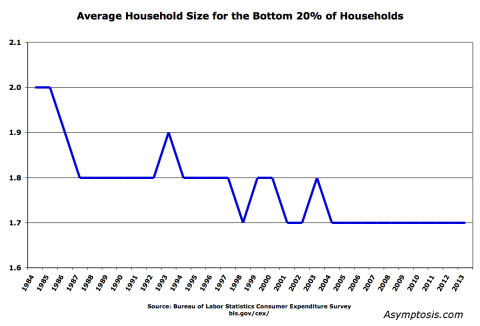 By Tcherneva’s measure this period is far and away the most egregious demonstration of the inequality trend we’re examining. Scott could have included recent years, with visual and verbal caveats explaining that the cycle is not complete, so the measure that period is not directly comparable. It has less explanatory power, but that doesn’t mean it has none. Omitting the very period that by Tcherneva’s measure are the “money proof” of the trend (and so omitting explanations of that period) arguably explains less about that trend. 3. Looking at the non-elderly population is arguably more accurate and is at least quite informative. It paints roughly the same picture, though less extreme. 4. Post-tax-and-transfer measures are arguably more accurate and informative, but again with the completeness problem. And he should explain that the pre-’79 picture would look quite different if it displayed post-T&T data; the bottom 90% would have been getting more of the pie, which would make the inequality trend look more pronounced than it does in his graph. I do wish he’d shown a graph as he suggested, including health/medical benefits in T&T (assigning a value other than $0), while explaining the methodological difficulties he points to. I have no idea how or how much this would change the picture. • The blatant inaccuracy of ignoring cap gains in #5. It completely misrepresents the situation. • The omission of recent years in #2 — the very years where the trend is arguably most apparent and egregious. Hiding the elephant under the rug? • The blithely dismissive headline of Scott’s first post. 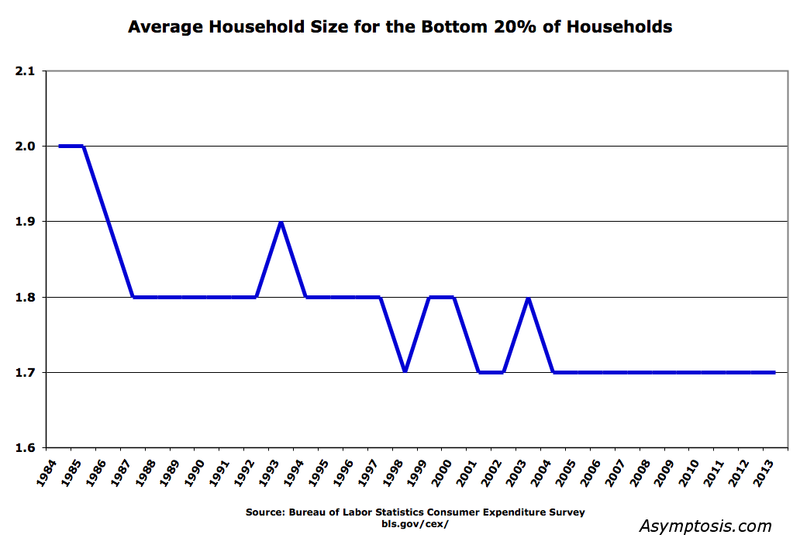 One really must ask: if income inequality is at “staggering” levels, how did it get there…if it hasn’t risen? I can’t see how to draw any other conclusion from this direct self-contradiction: he’s talking out of both sides of his mouth. I’ll leave it to my gentle readers to decide why. Takeaway: obfuscation is the opposite of explanation. Update: Scott has taken issue with my only-barely-implicit imputation of his motives. He’s right on that. I both regret that and apologize for it. I still think the import of his post (especially the “money chart” and title) — that inequality’s not that bad and not that important — contradicts his “staggering” stipulation, and is rhetorically pernicious. But that’s not the same as bad faith. I withdraw and apologize for any suggestion of the latter. I’m reprising a previous (and longer) post here in hopefully simplified and clarified form, for a discussion I’m in the midst of. “Saving” and “Savings” seem like simple concepts, but they’re not. They have many different meanings, and writers’ different usages and definitions (often implicit or even unconscious) make coherent understanding and discussion impossible — even, often, in writings by those who have otherwise clear understandings of the workings of financial systems. I’m going to talk about a particular meaning of Saving here: Personal Saving (by households) as defined in the NIPAs. Quite simply, it’s household income minus spending on newly produced goods and services. (It doesn’t include so-called spending to buy already-existing assets like deeds, stocks, bonds, or collectibles like art.) It’s a very different measure from household-sector Gross or Net Saving, which I won’t describe here. Your employer has $100K in its bank account. You have zero. Your employer transfers $100K from its bank account to yours to pay you for work. You’ve saved (in the Personal Saving sense). But is there more Savings in the banks? Obviously not. Now you buy $100K in goods from your employer, transferring the money from your account to its. You’ve dissaved (spent). Is there more or less Savings in the banks? Obviously not. Now say instead that, being frugal, you only transfer $75K to your employer for goods. You’ve “saved” $25K. That’s “Personal Saving” in the NIPAs. Is there more or less Savings in the banks compared to the first scenario? Obviously not. When households save money, that (non-)act doesn’t add to the stock of monetary savings (the mythical stock of “loanable funds”). Thinking about the accounting entries may help explain this. 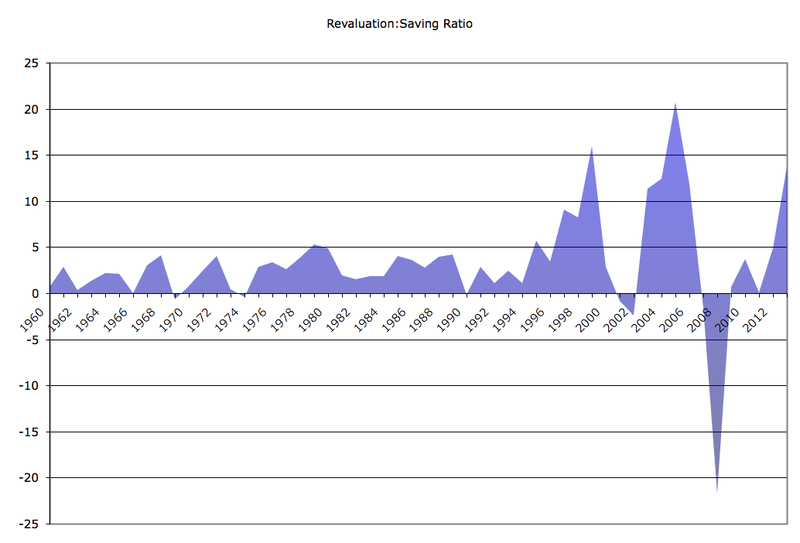 “Saving” is a flow, as opposed to a stock. Every accounting measure must be one or the other. (A flow is measured over a period; a stock is measured at a particular moment.) Saving is an accounting “flow” in that sense, but it doesn’t represent an actual transfer of funds from one account to another. It’s an accounting residual of two sets of actual transfers: income minus expenditures. You could say it’s nothing more than an artificial accounting construct — though a useful one for thinking about balance sheets and flow-of-funds and income statements. Since Personal Saving doesn’t transfer anything anywhere, it can’t increase the stock variable, Savings. What does cause Savings to increase? Spending. Banks are obviously different from households. But I think explaining two key differences goes far towards explaining why “endogenous money” theory — often pooh poohed as either confused or obvious — is important to economic thinking. The first is a dweeby accounting difference. The other, which arises from that, is very, very real. 1. When the banks lend to households, the banks expand their collective balance sheet. New assets (loans due) and new liabilities (deposits payable). When households “lend” (deposit their currency in a bank, buy bonds), they do not expand their balance sheets. They just shift the composition of their asset portfolios (currency traded for deposits, deposits traded for bonds). Unlike banks, households only expand their balance sheets by borrowing. New liabilities (loans payable) and new assets: houses residable, cars drivable, food eatable, education usable, health livable. The stuff of life. 2. 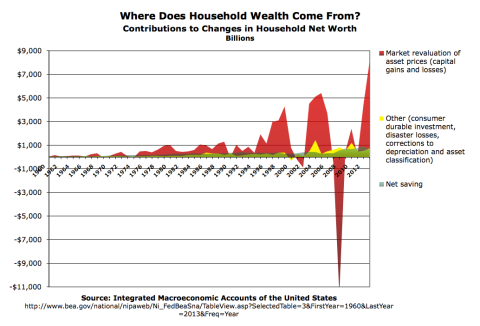 Households consume their assets. They have to, in order to live. The very necessary business of living constantly pushes their balance sheets towards imbalance — topped up, for most households, only through labor. Not so banks. They don’t consume their assets. They don’t have to, in fact can’t. Financial assets (claims against real assets) can’t be consumed. Banks’ assets are never diminished through consumption, or through use, decay, illness, obsolescence, or death. Excepting borrowers’ payoffs or default, banks’ assets are eternal and immortal (as are the banks, for all intents and purposes). Which exposes the whole notion of “patient lenders” and “impatient borrowers” as the wholesale claptrap that it is. When the banks expand their balance sheets by lending, they are not displaying “patience.” They are not “saving” in any sense of the word, and they are certainly not “patiently foregoing current consumption.” When a household displays “impatience,” it is the inevitable and inexorable impatience of life, passing. Bankers face very little or no personal risk from expanding their balance sheets; it’s just how they make money. Households, quite otherwise. Do with this reality what you will, but don’t tell me that the “patient savers and lenders” construct describes any real world that any of us lives in, or the incentives of the lenders in that world. I’d like to respond to his many excellent points in just two ways. 1. My critique is primarily of his rhetoric, not his reasoning. Progressives, IMO, should be shouting the manifest reality from the rooftops: progressive administrations in the U. S., over many decades and looked at every which way from Sunday, have delivered resoundingly superior economic performance by pretty much every economic measure. (Occam’s explanation: better economic policies.) 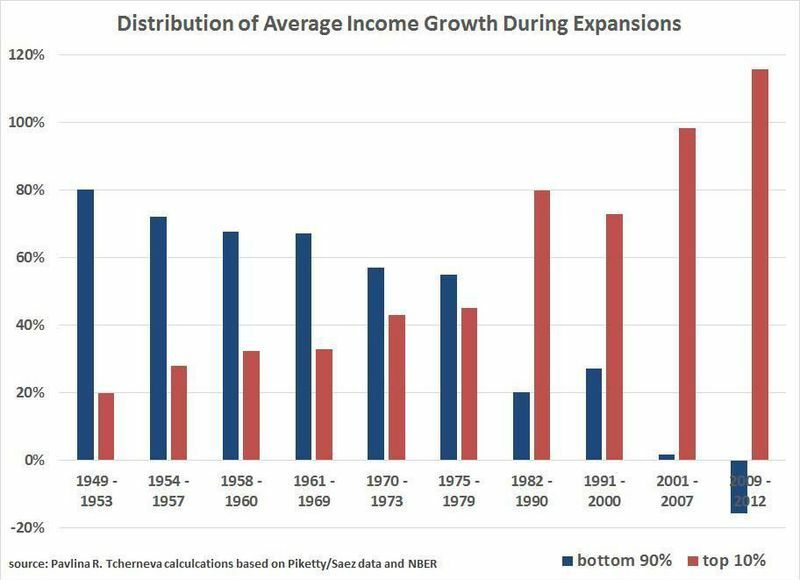 By contrast, the skyrocketing wealth and income concentrations delivered by the Reagan Revolution have been accompanied by stagnation, instability, and — by many important measures — decline.